For 30 years now Mitchellson has been helping clients develop their investments into exciting properties. From a small family run business, we have set out the foundations to develop into the dynamic business that we are today. We work on many exciting projects across the whole of the UK for a diverse range of clients. We specialise in building structures that start with services such as enabling works, temporary works, groundworks, leading into reinforced concrete sub-structures and super-structures. We also deal with waste management and run a successful plant hire business. Mitchellson has developed into a company renowned for providing value for money solutions to our client’s requirements. We pride ourselves on delivering a project that exceeds our client’s expectations. The high level of repeat business that Mitchellson achieves highlights the satisfaction of our clients. Our client base has grown considerably and consistently over the last thirty years. Brian FitzMaurice, Transport/ Workshop Manager is our elected Fuel and Emissions Campion and he explains how important FORS is to our Company. *No incidents or PCN’s for the past 12 months. We have recently adopted a recruitment policy to try and help us recruit young drivers into the Transport industry. We only have 1 Operating centre and we use it for parking our lorries. All our servicing is done by main dealers at their sites not ours. The only noise generated is when my lorries are idling so we can carry out our defect checks. All my lorries have white noise reversing alarms fitted to them. We carry plant equipment to construction sites across the whole country. As we rely on our customers asking us to deliver to various construction sites across the whole country, we never know where we are going until they need us. Therefore we can’t afford to try and move anything via barge or train as we collect all the equipment from building sites and there is no other method than using a lorry and we then asked to deliver anywhere in the country. So using a Lorry is the most cost effective way of moving our clients goods. 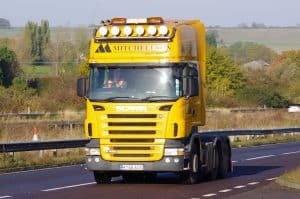 We are replacing all our lorries with Euro 6 engines as and when they are due for replacement. We have looked at electric vehicles and because of the weights we carry and the fact that our lorries have specialist equipment fitted no manufacture have produced an alternative fuelled vehicle that can carry the weight we do and go over the same terrain we do.